All transactions are safe and secure with a reliable history in online purchasing behind each of our associates. 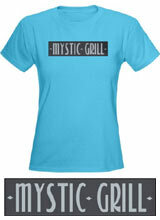 Buy the Mystic Grill t-shirt to own Vampire Diaries clothing and merchandise. In small towns like Mystic Falls, there isn't very much for teenagers to do. Rather than be bored, some of them take jobs and one place they work is the Mystic Grill restaurant. For example, before Stefan burns vampire Ben McKittrick to death, Ben works there as the bartender. In addition to Ben, Vicki Donovan waitresses there until she is staked through the heart. However, not everyone that works there becomes a vampire and is killed by Stefan. Vicki's brother, Matt Donovan, is still very much alive and human. If you wish the Mystic Grill was your local hot spot, then eat up this Mystic Grill t-shirt. In addition to the Mystic Grill tee above, browse the Vampire Diaries Clothing Gallery for more apparel like men's and women's clothes, kids shirts or hoodies.